Human hair is primarily made up of a protein called keratin and is an excretory product of the hair follicle. The hair follicles generate new hair cells every day and the old cells are pushed out from the surface producing a string of dead keratin cells called hair. The average adult has about 100,000 to 150,000 hairs, and one can lose up to 100 hairs daily. So, if one finds a few strands of hair on their hairbrush, they needn't necessarily worry about it. However, if one starts to lose more (>125 strands/day), it should no longer be considered as normal, and this symptom can signal hair loss. Anagen- Active phase wherein there is active hair growth. This phase lasts for 2 to 6 years. Catagen- This is the transitional phase wherein the hair starts shrinking. It lasts for 2 to 3 weeks. Telogen- This is the resting phase, which lasts for about 2 to 3 months. At the end of this phase, the hair is lost and new hair replaces it, and the next cycle begins. As a person ages, their rate of hair growth slows down while the hair loss continues. There are many types of hair loss. Let's go through them one by one. Involutional Alopecia: This is a natural condition in which the hair slowly thins with age. With age, more hair follicles go into the resting phase, and the remaining hairs start getting shorter and lesser in number. Androgenic Alopecia: Contrary to what the name suggests, Androgenic Alopecia is a genetic condition that can affect both men and women. 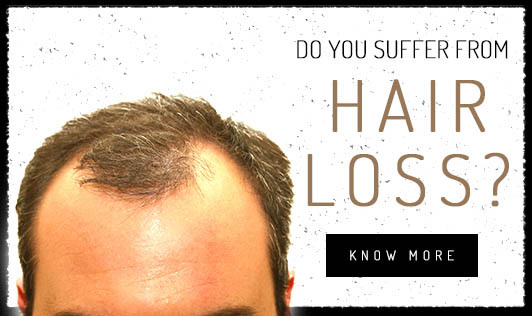 Men suffering from this condition can start losing their hair as early as in their teens or 20's. They usually show male-pattern baldness, which is characterized by a receding hairline and steady disappearance of hair from the crown and frontal scalp. Women with this condition experience thinning, only in their 40's or later. They usually experience thinning all over the scalp, which is most extensive at the crown. Alopecia Areata: Alopecia aeratea starts suddenly and causes patchy hair loss in children and younger adults. This condition can cause complete baldness, however, in about 90% of people the hair returns within a few years. Alopecia Universalis: In this condition, the whole body hair falls out, including eyebrows, eyelashes, and pubic hair. Trichotillomania: This is a psychological condition in which a person pulls out one's own hair. This condition is more common among children. Telogen Effluvium: In this condition, there are changes in the growth cycle of the hair which leads to temporary thinning all over the scalp. During this phase, large numbers of hair enter the resting phase at the same time, leading to hair shedding and subsequent thinning.